Bikers must rely on their gear as their life can depend on it. If you do not wear a good helmet and gloves while riding, you run the risk of harsh injuries every time you go off. Your priority after protecting your head is to safeguard your hands and fingers against damages. The Best Motorcycle GPS Reviews You Should Have! Why wear gloves? You wear these to protect your hands against hard impacts when the worst happens, no matter what road conditions..
We all learn by instinct to brace our bodies for impact whenever we fall or hit a barrier. When you are suddenly caught flying over handlebars, you will instinctively stretch your arms to catch yourself as you fall. You will inevitably reach out for the onrushing ground with vulnerable hands and fingers and take some hurtful hits. That is why after a good helmet, a pair of the best motorcycle gloves is necessary if you are serious about safety. The helmet may be the most critical protective wear, but even a top-rated helmet is not the only protection you will need when accidents happen on the go. Even at 25 mph, a tumble is not likely to leave you with just a bad case of road rash. Chances are you will be bruising more than just skin. Your hands will thank you for being shielded from the elements, which can include not just freezing wind or spray but also bouncing stones and roadside branches. You should be able to practice your skills more with the better grasp your hands can maintain with gloves on. 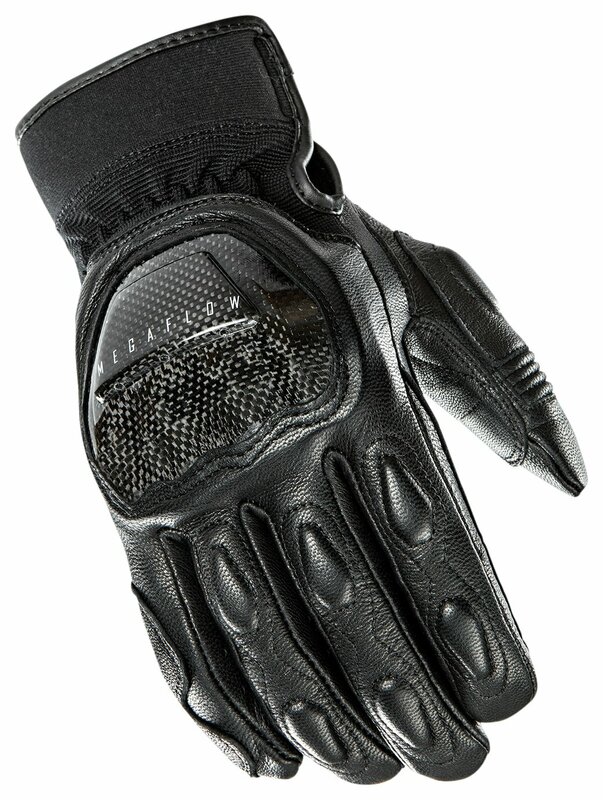 Get the best motorcycle gloves you can find, as you will ride with more comfort with a pair on. When riding around on a hot summer day, mesh and perforated-leather glove bodies with vents and short cuffs are better at breathing in cooling air in the heat. Designs with sealed shells, cozy linings, and long cuffs should keep your hands warmer in winter against the onrush of cold wind. You will also enjoy good protection on the road and trails against flying debris and splashing mud and water. And on long rides under a blazing hot sun, long-cuffed models will prevent your forearms from being badly sunburned. And yeah, the nicer ones come in designs and colors to sharpen your looks, and that’s all good right? The most important things your gloves do is to keep your grip good and your hands protected from debilitating injuries during tumbles and skids. When you are picking a pair, search for high-quality stitching, especially around parts which may suffer impacts in a spill. You should look for leather and nylon material that is light yet tough, with hardened pieces to protect the knuckles. Choose gloves with abrasion-resistant layers to cover areas that are likely to be injured during falls, particularly the palms. Check for added armoring, like sliders around the palm and inserts in the padding that protect your hands’ exposed parts. Gloves with contoured bodies and fingers can shape your wrist and finger motions in order to avoid excessive twisting injuries from rolls. I am just as concerned as you are about my safety and ability to ride to my heart’s content. That is why I’ve written this guide to five of the best motorcycle gloves available for use in various situations. From mesh to leather to full-gauntlet types, I have reviewed here a range of models for riders of different styles and disciplines and in various situations. But whatever you decide, make sure to always wear the best protective helmets and gloves you can afford. I’ve sorted the following recommendations for use by commuters and sports riders and in different seasons or road conditions. There is also a set for serious racers, which shows what’s possible at the high end of performance and features. Even the most perforated leather cannot breathe as comfortably as mesh-type models. The webbed material of these gloves works well to flow in lots of air around your hands for greater comfort. This can really help to cool your palms and knuckles when you are rolling in hotter weather. Aside from the airflow, which helps with hot conditions, the ergonomically designed body has a pliant feel comparable to cowhide. These budget gloves are designed for agile activity where you need fine motor skills to succeed. Finger joints bend fully to let you freely manipulate controls. 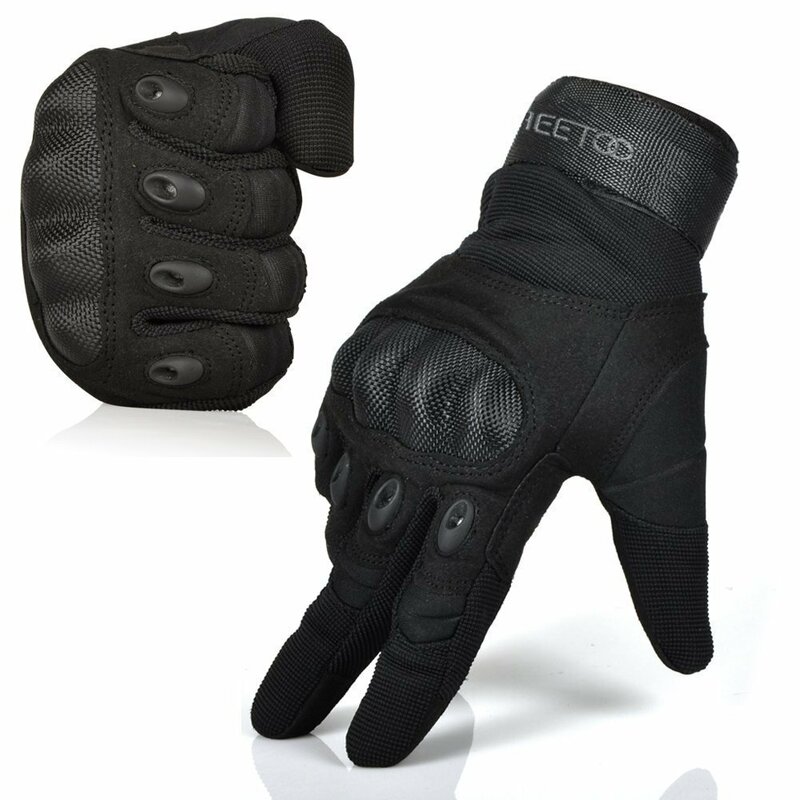 The Freetoo is well known in various sports and tactical disciplines, but you should find it a great biking glove. Each glove has a backside that is constructed of tough mesh, with hardened plastic ridges over each knuckle. The reinforced area around the palm is padded with a hardwearing material that is proof against scratches and most hard scrapes. The Freetoo’s webbed form is elastic enough to counteract the folds that normally happen when you grip the handlebars, if you get the sizing correct. You should consider getting the next larger size as these gloves are mainly marketed to Asians with smaller hands. They currently come in black and other low-contrast colors, which may make your gestures less easy to spot at night. However, it is a budget-priced pair that mostly performs well. 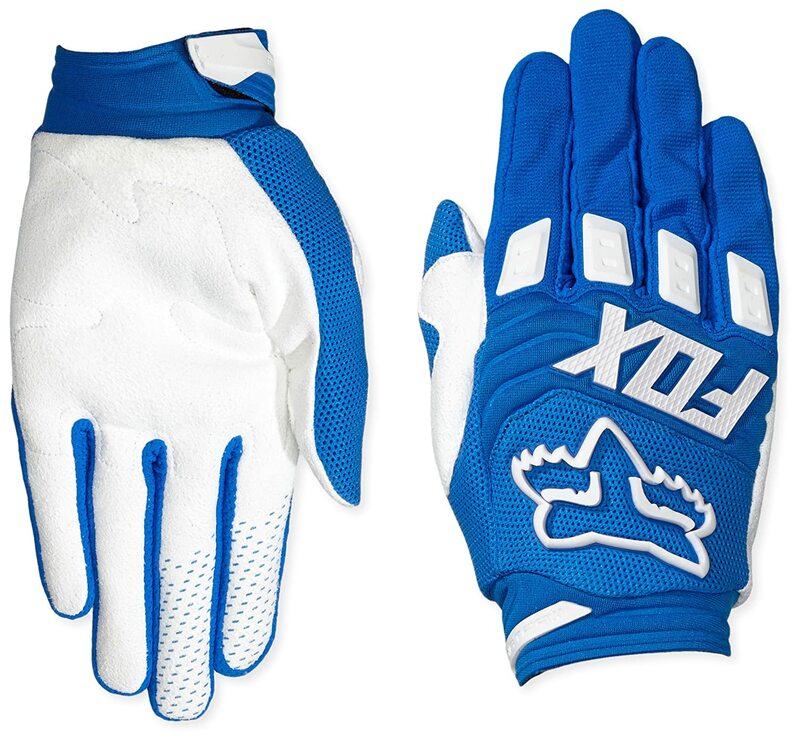 This an inexpensive pair gloves made of lightweight materials that work to wick moisture away. Although it is marketed to XC and mountain riders, bikers of all disciplines will like the extra bit of protection. It has the handy comfort of a light and short-cuffed glove but does not skimp on the safety features. Each pair’s body is stitched with supple Nylon and PU materials which fit snugly after having been worn a while. The knuckles are is dotted with tough yet comfortable protective pads. Each gusseted finger joint did not feel too stiff due to the flexible design and the stretchy material used. Clarino synthetic leathers pad the palm area, which resists scratches and should protect fleshy parts during hard falls. You get a better grip on the controls with these gloves as each fingertip is coated with grippy silicon. The selection of bright colors is ideal for getting nearby drivers to see you hand waving in the dark. The Dirtpaw is a workhorse that should perform great whether you like riding sport bikes or traditional racers. Its classic styling would go nicely with just about anything you might wear on two wheels, from commuter suits to leather jackets. If you are riding hot and dusty trails, you are likely to swap hard armor for airier shells. These are reasonably affordable sports gloves with a breathable design that’s great for active bikers in need of advanced protection. The body is constructed of drum-dyed cowhide, which holds the shell and webbing. Wide carbon-fiber pieces over the knuckles’ ridge give protection for when tumbles happen, and the padding is comfortable. Palm areas are double-padded with leather that can better resist abrasions during sliding scrapes. 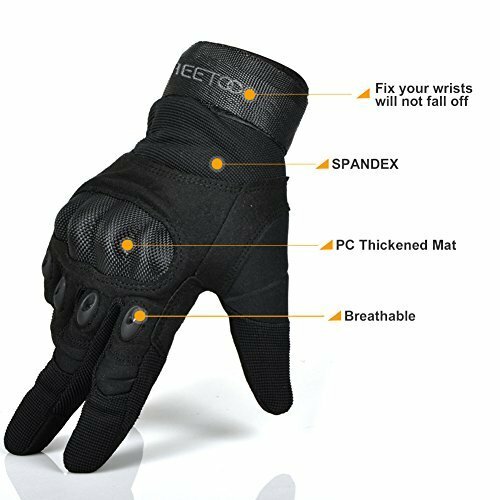 Mesh at the wrist and backside vents let in cool air to comfort your hands during hot and rough summer days, with the tough leathers as protection. The higher-density foam is plush, and thumbs have full flexibility with the expanding panels. You may find the hook-and-loop straps convenient for adjusting the neoprene cuffs, but do keep them off the mesh parts. The Speedway's mix of leathers and mesh gives active protection in hot climes. You will not get much extended use out of the pair once cold or wet conditions come in, though. If you ride during the cold months or live far north of the snowy line, you will need to keep your fingers from going numb in windy cold. 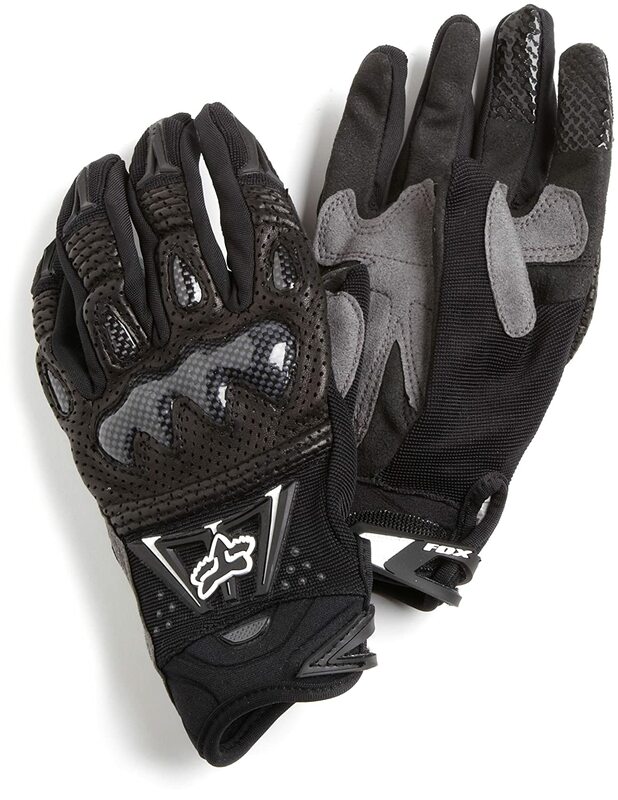 These relatively affordable gloves are essentially sporty gauntlets for winter riders. Your fingers should remain warm during as the padding traps air for insulation, which works great with heated grips. They have longer cuffs to restrict inflowing cold air and waterproofing to keep things dry. The nicely contoured shell and warm lining work to keep the elements out. They retain warmth, and destress your hands by letting them breathe a little. Tough-wearing pads line the knuckles’ ridge, while the supple leathers work to ensure the finger joints can bend well. The tactile experience is good, and the gloves’ interior lining does not heat or cool too much in spots. Tough leather on the palms helps for grasping controls while providing protection in case of falls. You can readily adjust the area round the wrists and the cuffs with its quick and easy hook-and-loop arrangement. Just remember to buy the right size to make sure of a supple yet cozy fit. This pair of gloves is for serious street and track racers looking for the best protection. It is the choice of professionals who are anticipating spills on the fastest tracks and wildest trails. The lightweight design features individually molded polycarbonate pieces and ballistic plates to protect your knuckles and your hands’ backsides. Heavy stitching affords the body an elastic fit, and the nylon-polyester mesh and Pittards perforated leather is durable and breathable. The palm area is double-stitched with dual Clarino leather layers for more resistance to abrasion. There is little of the stiffness that can arise when you grip handlebars and mash brakes tightly during fast-moving incidents. One top-end protective feature is the pre-curved shell, which can protect your fingers from the worst twisting injuries from rollovers. The reinforced leather thumb guards also let your hands get a better, safer grip on things. Thoughtful design details abound, such as leather top panels, silicone-coated fingertips for better dexterity, and breathable gusseted construction. Convenience features are not skipped either, with hook-and-loop straps to let you easily adjust the wrists and neoprene cuffs. MTB veterans gave inputs to help develop the Bomber’s flexibility and armoring, and it shows. This model is currently the costliest of those I have reviewed here. However, it is also the one delivers the most protective measures. That level of performance makes it worthy for the pros, and perhaps it is for you as well. 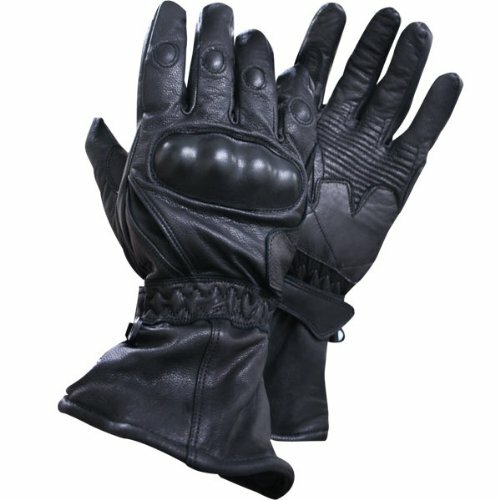 Whether you are rolling the highways, negotiating dirt tracks, or moping around parking lots, you will need the best motorcycle gloves to lessen aches and avert injuries from scrapes and falls. Fortunately, there’s a variety out there featuring different levels of protection and comfort to suit varied riding styles and seasons. There is no one ultimate winner here unless you go by pure scoring for protective features without considering usage or weather conditions, which would point you to the Fox Head B﻿﻿ombe﻿﻿r. For veterans who risk body and limb at the extremes of pro racing, that alone can justify its high price. In most cases outside the racetrack, you should decide according to what fits your needs and lifts your confidence. You can choose from among these gloves with confidence, based on what I appreciated about each pair.